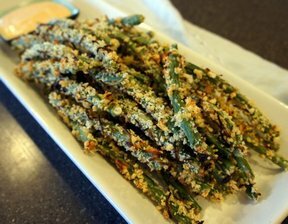 Fried up in a pan with little mess, these asparagus spears are so flavorful you won't need those potato fries. Be careful not to burn the garlic as it becomes bitter. Break off the tough ends of the asparagus. 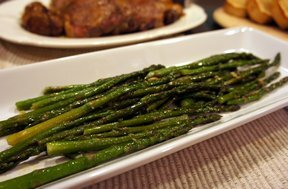 Place the asparagus in a skillet. 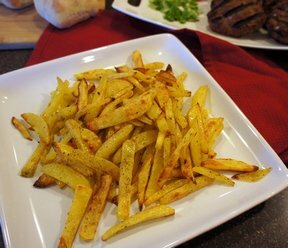 Drizzle with olive oil and sprinkle with salt, ground pepper and Tony's Creole seasoning. Toss asparagus to coat. Add the chopped garlic to the pan. Turn the heat on high to add a little grill to the asparagus, about 4 minutes. Reduce heat to low and cover the pan to allow the asparagus to steam, about 6-8 minutes. 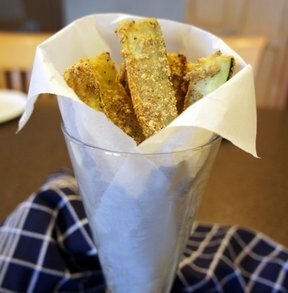 TIP: The amount of time you cook the asparagus will be based on your preference of asparagus crispness. "I omitted the Creole seasoning. Kids enjoyed this but not as much as me!"